Rainbow Fish by Marcus Pfister was one of my kids’ favorite preschool books. We read it until the pages peeled apart and the binding had to be taped together…it was a well-loved book. So, when we were thinking of children’s books to inspire Christmas ornaments, Rainbow Fish was the obvious choice. This Rainbow Fish-inspired ornament for kids is the perfect addition to any kid-friendly Christmas tree! Never read Rainbow Fish? Grab a copy of it here! This fun Christmas craft is what creative kids crafts are all about. It gives children a chance to make an adorable children’s book character and add details and colors as they see fit. We had so much fun choosing the glittery pompoms for the ornament that we could have made a dozen rainbow fish inspired creations! Pro-Tip #1: While we did use craft glue, if you prefer to use plain school glue, simply swap out the foam for blue cardstock. We found that school glue, glittery pompoms, and craft foam were a losing combination. Pro-Tip #2: Don’t worry about having the exact color pompoms that the real Rainbow Fish has. It’s all about fun and creativity! Pro-Tip #3: Use string or simply punch a Christmas tree hook through the fish’s dorsal fin on top to hang it from your tree. Pro-Tip #4: Don’t forget to have your child write his or her name on the back and date it with the year! Pro-Tip #5: Have fun and don’t expect it to be perfect! Print out the patterns and cut them out. Trace the body pattern onto the blue foam sheet and cut it out. Trace the lips pattern onto the yellow sticky foam sheet and cut it out. Using the craft glue, glue the pompoms to the center of the body of the ornament. Glue the googly eye onto the face. Unpeel the backing from the lips and stick them to the face of the fish. Use the glitter glue pens to draw on the fins to add pizzazz. 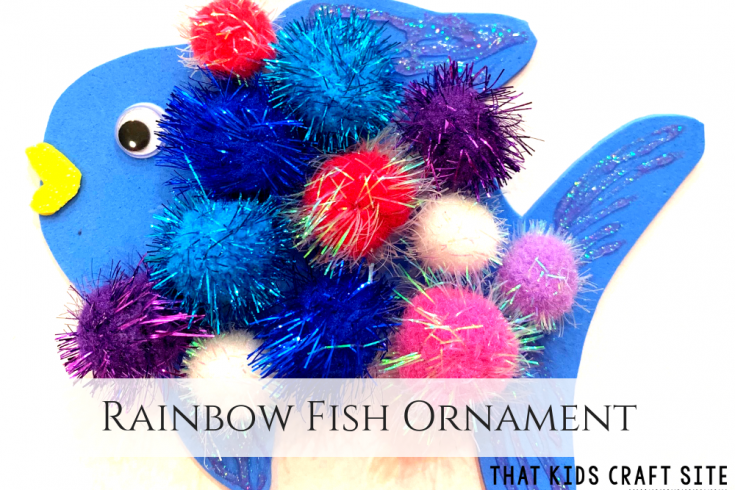 If you decide to make your own Rainbow Fish ornament, be sure to tag us on Instagram @ThatKidsCraftSite! We’d love to see how yours turned out! 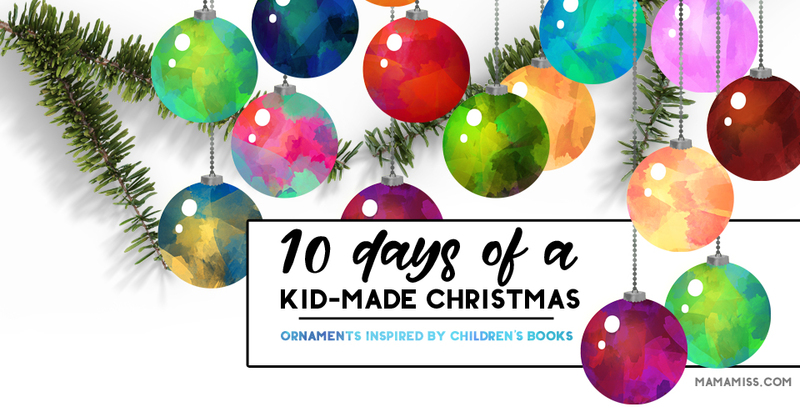 Be sure to check out these other amazing kid-friendly ornaments from some of the best and most creative crafters around! All of the ornaments are based on children’s books, so they’re the perfect combination of creativity and learning. Get a complete list of all of the fun ornaments over at Mama Miss. Melissa is graciously hosting this year’s ornament round-up! Thanks, Melissa!! Here are the ornaments happening today – Day 7! A Narnia-Inspired Lightpost Ornament from my activities site, Mama Teaches: This one is perfect for teens and tweens who are into sewing! Grinchmas Fingerprint Ornament from Nadia at Teach Me Mommy: Love the story of the Grinch? This is the ornament for you! Origami Kimonos from Crystal at Castle View Academy: We love origami ornaments, so this one looks especially fun to try! Take This Rainbow Fish Craft With You! 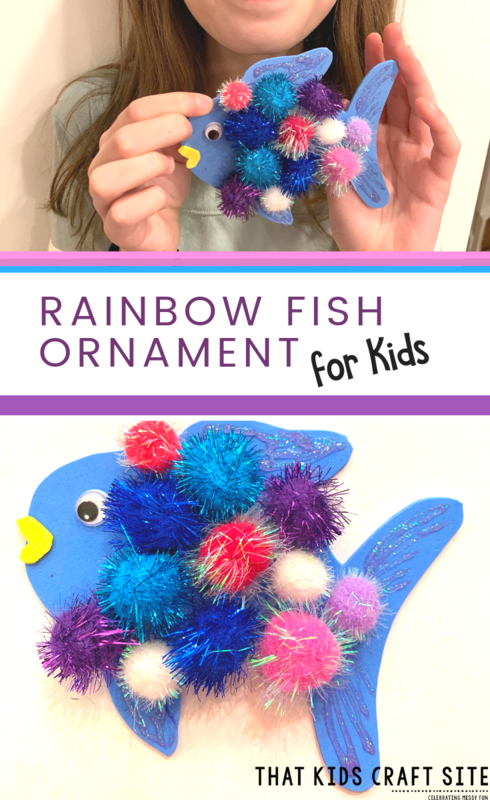 This Rainbow Fish book inspired children's Christmas ornament is packed with creativity and crafting fun! It's perfect for preschool and up! While we did use craft glue, if you prefer to use plain school glue, simply swap out the foam for blue cardstock. We found that school glue, glittery pompoms, and craft foam were a losing combination.